Mergansers in the Hood ~ future painting material! It was a very cold New Year’s Eve day but I thought I’d head over anyway to the Pitt Street Bridge in Mount Pleasant, SC, to do a little birding. I was hoping I might see a few Hooded Merganser ducks in order to get better pictures of them for painting material. Since I was taking the day off from painting I timed my outing around low tide. Wading birds, ducks, and other shorebirds love to feed at low tide, so there is usually much more birding activity at feeding time. Even though it was cold and the sun was going behind the clouds, the birds were out enjoying the last day of 2017, feeding in the fertile wetlands on either side of the old bridge that is now disconnected and maintained as a park-like area for walking dogs, fishing, birding, and enjoying sunsets. The wetlands are home to oysters, clams, mussels, crawfish, and small fish, providing a free-for-all seafood diet for the birds. 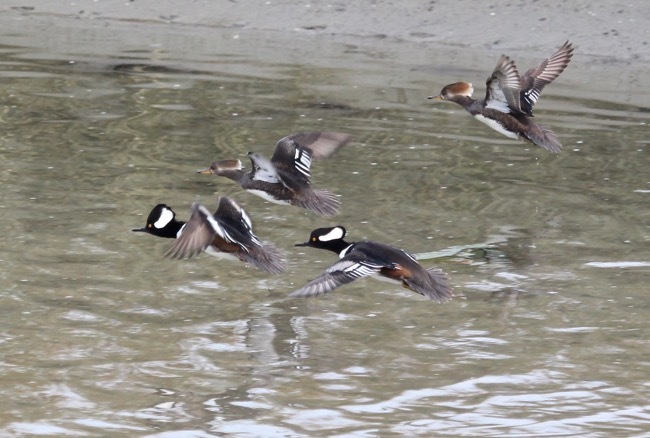 The male Hooded Merganser has a black and white crested head, which inflates and looks oversized when it is trying to attract the female mergansers. The females are understated in coloring, but elegant in their own way with a cinnamon colored crest, which also inflates but not quite as much as the male. They have a cool look with energetic and sometimes funny behaviors, which I find fascinating. When the males rise out of the water and flap their wings it is always amusing. Well, my hunch was right and the Hooded Mergansers were actively feeding up and down the waterway through the marsh grasses. They were so active that they didn’t mind people like me stopping to take their picture. Other birds like a Tri-colored Heron, a Little Blue Heron, and a Snowy Egret were joining them along the shoreline, jabbing at fish that the ducks seemed to be stirring up and confusing in the water. It was at times a feeding frenzy. At other points they were just paddling around and enjoying a cold swim. I have rarely seen Hooded Mergansers, but seeing so many up close in their natural habitat and so active was a field day for me. I took hundreds of photos that day, even though the sun wasn’t cooperating. Here are a few more pictures from my last birding outing in 2017. It was very productive for I now have enough resource material to do a number of paintings of Hooded Mergansers when the time is right. I hope you enjoy seeing the pics! Thank you as always for your interest in reading my journal and for following my art and photography. I’m currently working on a big painting of a Charleston street scene featuring a horse and carriage ride through the historic French Quarter. I will be blogging about the finished painting in the next week or so.